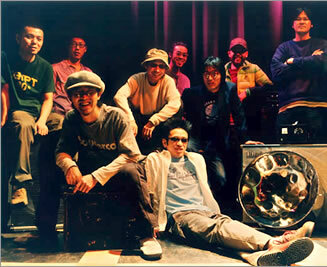 Little Tempo is Japan’s no.1 dub band. The members originate from SILENT POET, formed in 1992 by a group of art students. They have since been one the most influential bands on the Tokyo club scene. They released their debut album LATITUDE collaborating with horn players from Jazz Jamaica such as Rico Rodriguez, Eddie “Tan Tan” Thornton and Michael “Bammie” Rose. Their second album THE WAY BACK HOME followed by the dub album THE WAY BACK HOME DUB mastered by the UK’s dub engineer, Henry Holder. Released maxi single “USUAL THINGS” featuring vocalist Eddie Reader and poet Linton Kwesi Johnson. Released an instrumental double album “RON RIDDIM”. Released another maxi single “LITTLE TEMPO meets VOICES OF FLOWERS” featuring Linda Lewis and Trio Esperanca, recording in London and Paris, which included a collaboration with the specially formed Brixton group Fresh Funky Four. Their 4th album “KEDACO SOUNDS” was collaboration with Yumiko Ohno from Buffalo Daughter, Genichi Tamura from Astro Age Orchestra and Likkle Mai from Dry & Heavy. Their first major national performances at the FUJI ROCK FESTIVAL and RISING SUN FESTIVAL. Little Tempo members pursue solo projects. Takeshi “Tico” Toki, bandleader, collaborates with Pardon Kimura for a new album and produces Yoko Fujita. Seji Big Bird, the bass player, works with one of the original SILENT POETS group, Shimoda, on a DJ project, MINTOS. Ikuma Sasaki, guitar, works on BREATH MARK album and Hakase, keyboards and ex-Fishman member, releases his own solo album. They reform and play as Little Tempo in Tokyo’s Liquid Room. The band released their first album” MUSICAL BRAIN FOOD” in May and its dub version” FIREBLENDER” in August since they signed with Speedstar International.These albums contain not only reggae and dub but also other element such as calypso, jazz and rock and created new sound and received good feedback.In June, the band was invited to “Melt Down Festival” which organizedby Lee “scratch”Perry in London and shared stage with himself and Macy Grey.After the festival, the band stayed in London and had some gigs at small clubs like GAZ’S ROCKIN BLUES and on the street in Waterloo.They participated in one of the biggest summer events in Japan called Rising Sun Festival and some events across Japan in August.And now the band started working on next album, which is a sound track for a film, directed by Katsuhito Ishii and the film will hit theaters next summer. Original Sound Track “TASTE OF TEA” was released in JUNE. The album “SUPER TEMPO” was released on March. We released the 7 inch singles of four sheets in succession, and released the latest dub album dubbed at Sparkside Studio,London.–featuring Rico Rodriguez & Tony Uter!—-titled “SUPER DUB”. This one originally recorded and “dubbed” by Naoyuki Uchida…our original dubmaster. And in “SUPER TEMPO TOUR” and “SUMMER TOUR which were ventured with those album’s sale, we demonstrated the ability as a live band which has increased maturity still more. And we also challenged various experimental trials, such as playing together with Kohji Futaba and DJ KENTARO (DMC world Championship)at the places of live. Moreover, it appears on “tokyo sound revolution” performed at sodra teatern of stockholm. And,the party “Tropical X’mas Nite” in Daikanyama UNIT greeted the two above-mentioned persons, ended with a great success. We aim at the further activity regardless of inside and outside. in March…We held a special show of “legend series” in Shibuya Quattro with legendary Kiyoshi Matsutakeya as a special guest. This event collected the big topics. in September…The Second “WAI WAI FESTIVAL” at Hibiya Music Bowl, was given to nice weather and greatly succeeded. Gorgeous, cool guests are : EGO-WRAPPIN’ / GONTITI / Kazufumi Kodama / Kiyoshi Matsutakeya / PJ / Kenji Jammer / Rankin Taxi / Icchie / Tetsu Nishiuchi …ETC. in October…We played with Sim Redmond Band as a Jam Band from U.S. at Aoyama CAY. in?December…Customary Christmas Live at Daikanyama UNIT was also large flourishing. Likkle Mai & The K , Icchie were invited as the guest. Besides this, we performed to a lot of festivals of the whole country. And made spectators exciting! As new releases in 2009, Sunshine Love Steel Orchestra released their 1st Album “Sunrise”. This Steelpan Trio is formed with 2 pan men from Little Tempo and Yumiko Ohno from worldwide known rock group “Buffalo Daughter”. ?Little Tempo presents “WAI WAI Festival 2008” was released as DVD movie. This is a release from their own “Sunshine Records”.